Beautiful Nature Drawing & Still Life is designed for artists who are interested in learning advanced technical skills, specific to rendering drawings in the styles of realism, hyper realism, surrealism, and photo realism. 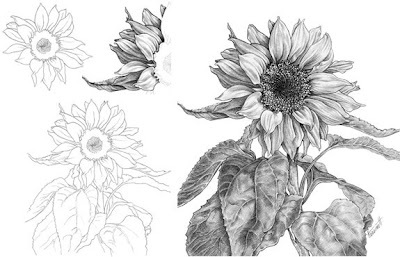 This advanced lesson has very few text instructions; rather, a series of illustrations takes you through the process of drawing a delicate sunflower. The overall values are low in contrast to depict the lights and darks created by the natural soft lighting of an overcast day. 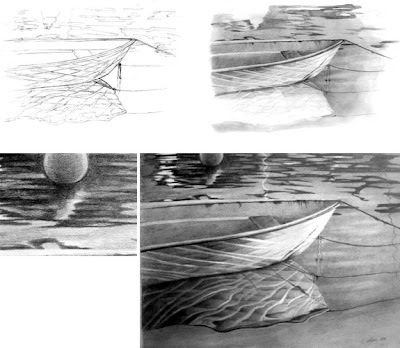 Drawing water is a perceived difficulty for many artists. However, when you break down the values into shapes, a lot of the mystique is removed. In this project, the techniques that apply to creating a drawing of a boat with its reflections will be revealed, as will the secrets that make water appear, well watery! Using both geometric and atmospheric perspectives, you create a three-dimensional space within a forest. Emphasis is also placed on several techniques for rendering textured values. In this project featuring a detailed drawing of a dagger rendered from a photograph, artists use contrasting values to identify its forms, textures and patterns according to the lights and darks created by the dominant light source. In this project, you use graduated hatching to define the three dimensional forms and the fuzzy texture of an adorable teddy bear. The little model for this project was incredibly cooperative. He stayed very still, didn't talk my ear off, and didn't require any coffee breaks!